From people you can always trust to be there. The Inverness Ear Piercing System has been in use for more than 45 years now in jewelry stores, department stores, salons, pharmacies, doctors’ offices, and body piercing shops in over 40 countries around the world. To date, we have pierced over 200 million pairs of ears. 1. Inverness is the only ear piercing system with fully-enclosed earring capsules that prevent our piercing earrings and exclusive Safety Back™ from being exposed to potential contaminants prior to piercing. Our earring capsules are sealed in sterilized cartridges that are not opened until selected for piercing. Unlike other systems on the market, our earrings are not exposed until they are safely inserted in the ear. 2. Our exclusive Safety Back™ allows for the safest healing possible by shielding the piercing tip and preventing the earring back from being squeezed too tight. This allows for proper airflow and prevents the earring back from becoming embedded during the healing process. 1. Unlike loud piercing guns that shoot a spring-loaded piercing earring through the tissue, our hand-pressured instrument is smooth and quiet. 2. Our system will pierce your ears and attach our exclusive Safety Back™ in one quick, smooth motion. 3. Our piercing earrings are specially-designed with ultra-thin piercing posts & a finely honed piercing tip to help the earrings glide through the lobe as easily as possible. To provide you with as comfortable an ear piercing experience as possible, all Inverness piercing earrings are carefully crafted with a sharp tip. For your protection, each earring comes with our exclusive Safety Back™, designed to cover the sharp piercing tip. We recommend checking that your Safety Back is securely in place daily, ideally after cleaning your piercing and before bed. No. In fact, we cringe when people call our piercing instrument a gun. Unlike our specially-engineered, hand-pressured instrument, piercing guns are spring-loaded and LOUD. Piercing guns “shoot” the piercing earring through the lobe. Our human-powered instrument is designed to pierce the ear quickly and accurately in one smooth, quiet, hand-pressured motion. The Inverness Ear Piercing System is used in mall stores, salons, jewelry stores, department stores, body piercing shops, pharmacies and doctors’ offices in over 40 countries around the globe. Please visit our store locator to find an Inverness location near you. What is the gauge of your piercing earrings? The posts of our earrings are .030” in diameter which is between 20 and 21 gauge. Is it safe to pierce my baby’s ears? Yes. Babies are pierced at a very young age worldwide. Inverness recommends that parents wait until after the first DPT vaccination which is usually administered at 8 weeks. However, this is a personal decision, and we recommend that you discuss your plans with your baby’s pediatrician before piercing. Do you have any ear piercing tips for babies & small children? 1. Do your homework. Make sure to choose a location that carries the Inverness System. Only Inverness piercing earrings have our exclusive Safety Back™ to shield your little one from the earring’s sharp piercing tip. 2. Consider selecting a location that is able to provide two associates to pierce your child’s ears simultaneously. The Inverness System is ideal for babies because it is extremely fast and quiet. Simultaneous piercings make the process even easier for children and their parents. 3. Celebrate and record this happy milestone, and be sure to Share Your Piercing Story with us! Can the Inverness System be used for body piercing? No. The Inverness Ear Piercing System is designed to pierce the earlobe and the outer cartilage of the ear. Our system should never be used to pierce any other body parts. Yes. Cartilage ear piercing with the Inverness System is just as gentle as a lobe piercing. How is the ear cartilage different from the earlobe? Cartilage is the strong, flexible tissue located in the upper portion of the ear. Cartilage differs from the earlobe primarily in that it has a limited blood supply. 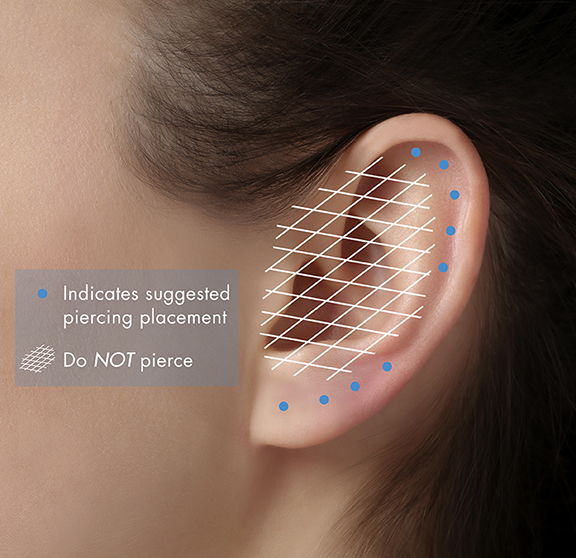 The diagram below shows where it is safe to use the Inverness System to pierce outer ear cartilage and the earlobe. Is it OK to change my earrings or take them out during the healing period? You should only switch into new earrings after the healing period: 6 weeks for an earlobe piercing and 12 weeks for a cartilage piercing. Newly-pierced ears are very sensitive and require special care and attention. If you take your earrings out for any length of time during the healing period, the holes may close or you may find it to be very difficult to re-insert earrings into a piercing hole that has not fully healed.